End of support for Microsoft SQL Server 2008 and Windows Server 2008 is coming up fast. Plan your migration and upgrade strategy today and improve the quality of patient care. Umbrellar is New Zealand’s leading Cloud Solution Provider, and home of the most comprehensive network of Microsoft Partners, resources, and expertise in country. We are here to help partners and customers be the hero in their very own NZ success story by leveraging the world’s best cloud infrastructure, advanced data, AI technologies, and productivity tools. We firmly believe in the value of cloud technology to enable the New Zealand digital health industry sector in meeting the demanding economic imperative to cut costs and improve the quality of patient care. To deliver this value Umbrellar work collaboratively across the health sector to ensure members are best informed of the latest ICT trends to stay ahead of the curve. Microsoft is to end-of-support two of its most commonly used Microsoft products - SQL Server 2008 and Windows Server 2008. 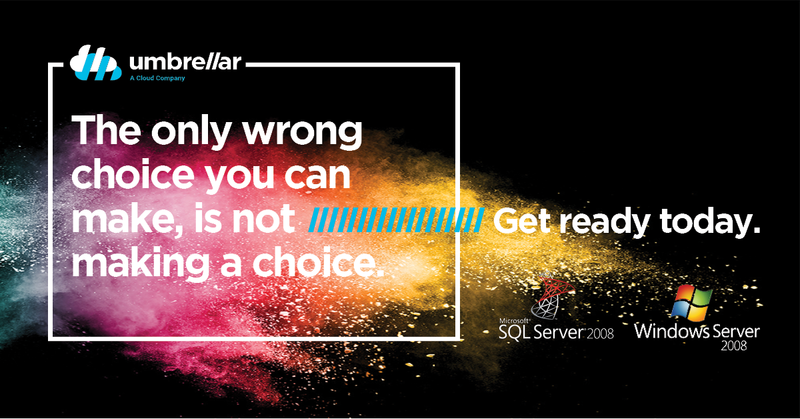 As of July 9th, 2019, security updates will stop for SQL 2008 leaving valuable data at risk. Security breaches happen every day, so it’s paramount to ensure you’re protected. The team at Umbrellar are prepared to assist you in choosing the best upgrade strategy to ensure you are equipped to adopt the innovate technologies needed to carry your business into the future. Mercy Ascot Hospital’s integrated cloud first approach to health care delivery has already saved countless lives. Now the Auckland, New Zealand–based hospital is undergoing a digital transformation to propel its services to the next level. By adopting a new electronic medical record and patient administration solution built on Umbrellar, Microsoft Azure, and Azure Stack technologies, Mercy Ascot aims to enhance its value-based delivery model to further improve patient outcomes while reducing costs. “Through interfaces based on the Umbrellar and Azure Stack infrastructures, clinicians will have easy access to all information, even scans and pathology results that reside in separate systems, in one seamless experience to greatly enhance decision making.” Dr. Lloyd McCann – CEO Mercy Ascot. The team at Umbrellar are your local cloud experts, and our technical specialists can support you from start to finish with this necessary upgrade.